Summary: In Targets of Deception, which suspense master Robert K. Tanenbaum called "a fast-paced thriller," Jeffrey Stephens introduced CIA agent Jordan Sandor, whom bestselling author Steve Alten praised as "terrific." Now Sandor is back, playing for bigger stakes and facing deadlier challenges. Whisked from his Manhattan town house to a gabled CIA safe house in Virginia, Sandor faces off with a top terrorist agent from Iran's Revolutionary Guard. In exchange for protection from his own side, Ahmad Jaber is offering the CIA explosive information: word of a secret, unholy alliance forged among operatives in the Middle East, a ruthless South American, and Kim Jong-Il's North Korea. Jaber claims not to know specific details, only that the strike will target the heart of America. The fanatics stage a stunning diversion in the Caribbean, mercilessly downing a passenger jet and unleashing an assault on a French intelligence installation. Sandor, however, has already moved in a different direction. Leveraging Jaber's infor-mation, he assembles a small strike force to penetrate North Korea. The team knows they will not all return, but the intel they gather will be vital to American security. What they ultimately discover plunges Sandor into a frantic race against time, struggling to defeat a shadowy figure—a master terrorist with a plan of destruction so perfectly disguised that even with the new knowledge he has gathered, Sandor cannot guess where or how he will strike. As a storm rages in the Gulf of Mexico, word comes that two submarines have penetrated U.S. waters. With the U.S. military hampered by the hurricane, Sandor turns to a few daring U.S. Navy SEALs to duel with the enemy they cannot see . . . for now they know only that there are two nuclear weapons aimed at a target of opportunity whose destruction would change the world order forever. 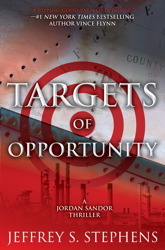 TARGETS OF OPPORTUNITY by Jeffrey Stephens is a story about a creative attack on the United States initiated by an alliance of North Korean, Venezuelan and Iranian terrorists. The author takes the reader from a safe house in Virginia to North Korea, Iran, the French West Indies, the Gulf of Mexico and Washington D.C. This story has a high level of action that includes the downing of a passenger jet, an assault on an intelligence complex in the Caribbean, the defection of a member of the Iranian Revolutionary Guard, a kidnapping of a North Korean government official, a category three hurricane and a nuclear weapon attack in the United States. There’s even an opportunity to involve the Navy SEALs. The lead character is a likable CIA agent named Jordan Sandor who displays all the typical characteristics of the hero agent – fearless, brash, insubordinate, attracted to women and trained to kill. His task is to determine where and when the terrorist attack will take place and how to stop it. He pieces the plan together after interrogating the Iranian defector, leading a dangerous mission into North Korea and investigating the attacks in the Caribbean. He, of course, is front and center in the heroics involved to stop the attack. I thought the overall character development was very good, starting with Jordan Sandor who, despite being a trained killer, shows feelings for members of his team who were captured in North Korea as well as for the woman who led him out of North Korea. He also displayed a keen sense of humor that seemed to fit the action very well. Adina, the Venezuelan mastermind high up in the Chavez government, was ruthless and trusted no one with the complete details of his plan. The Iranian agent, Ahmad Jaber, a cold blooded killer in the name of Allah, shares his information piece by piece as he extracts favors for his knowledge. He shows a softer side when he is rejoined with his wife who he abandoned in Iran to defect. Author Jeffrey Stevens provides a realistic touch to the story line by developing a plot that takes into account the current world political environment and displaying his knowledge of current weapons possibly available to terrorists. He also adds an interesting bit of knowledge about U. S. security measures. TARGETS OF OPPORTUNITY, although a little long at 422 pages, is a realistic, face paced suspense thriller about international terrorism that anyone interested in this genre will enjoy. Thanks to the publisher for providing a copy of this novel and to Booking Pap Pap for his insightful review. I like to read a thriller every once in a while even though it's not a go-to genre for me. PSU -- you can only imagine what our newspaper focuses on these days. This sounds scary! I'm glad it's so well written! Terrific review! And you just solved a Christmas gift dilemma for me too. I've been looking for a book with these elements for my girlfriend's husband. I think he'll love it. Usually we get the same books as BPP, but I haven't seen this one! And just when he gives quite a positive review!